LORETO Cavan made it two Lidl All-Ireland Post Primary Schools ‘A’ titles in the space of just a week as a stunning defensive display in the second half of their clash with Intermediate School of Killorglin secured a famous victory for the Cavan school at St. Rynagh’s GAA grounds in Banagher this afternoon, adding the Junior crown to the Senior title they collected last Saturday. Loreto’s double emulates the feats of John The Baptist, Limerick, who claimed the senior A and junior A crowns last year. The 2018 junior A final was finely balanced at the break when Kerry school ISK led by 1-7 to 1-6 following an end-to-end encounter that was lit up by the brilliance of Róisín Griffin of Killorglin and Áine Reilly of Cavan at either end of the field. A slight wind advantage was set to favour the Munster champions in the second half and that tilted the balance of favouritism their way, but the introduction of Clodagh Kennedy off the bench proved to be a masterstroke for Loreto College as she hugely curtailed the influence of Griffin in the second half. Reilly wasn’t quite as influential after half time either but the Cavan school seemed to have attacking weapons all over the field, including substitute Lucy Jane Grant who really sent the crowd wild when she posted the match-clinching goal with injury time looming. Reilly got Loreto out to a great start when she put herself in the right place to pick up a rebound off the post and slam in a goal after just three minutes, but the Kerry students dug their way out of that early deficit and took the lead midway through the half when Griffin’s first attempt on goal was blocked by Ciara Kellegher, only to snap up the rebound and pick out the top corner of the net at the second time of asking. A couple of scores from Fodhla Houlihan helped them to move 1-6 to 1-2 in front, but Loreto College rallied before half time and crucially, pulled the gap back to within a point before they went into the dressing rooms. Loreto kept that momentum going after half time and while they racked up a number of wides, they dominated the Killorglin kick-out and gradually moved into the lead, with senior medallist Niamh McCorry particularly influential. 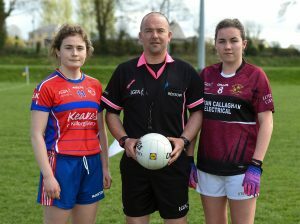 The tie swung decisively in favour of Loreto when a Killorglin penalty shout was waved away by referee Jonathan Murphy, and a swift breakaway move down the field saw Áine Reilly and Aoife Crowe set up McCorry for a decisive goal. Ailbhe Clifford scored a fine point to cut the gap back to three points but Loreto dominated from there, with Lucy Jane Grant adding 1-1 as they wrapped up their famous double. Loreto, Cavan: Á Reilly & N Crowe (2f) 1-3 each, LJ Grant 1-1, A Walls 0-2, E Brady & D Beck 0-1 each. IS Killorglin: R Griffin 1-6 (3f), F Houlihan 0-2, A Clifford & E O’Connor 0-1 each. Loreto, Cavan: J Reilly; C Kellegher, H Smith, N Brady; K Tuipulotu, M Smith, O Murphy; E Brady, D Beck; A Cahill, N McCorry, L O’Reilly; A Crowe, Á Reilly, A Walls. IS Killorglin: C Fealey; S Foley, E O’Connor, B Brosnan; O Dunphy, K McGlashan, A Nolan; A Clifford, R Evans; N Moriarty, C Joy, E Burke; M Duffy, R Griffin, F Houlihan.